As readers of Sound On Sound, you must have some kind of recording gear already, but how do you go about making your chosen setup suitable for music-for-picture work? To some extent, this is an impossible task for someone other than yourself to suggest. We all have different preferred ways of working — that's why everybody's studio is a bit different — and this is as true for media composers as it is for home-based recording musicians. You'll see just how true this is in the later parts of this series, which will be written by a TV and film composer based in the States with a very different setup to mine! Nevertheless, if you study the setups of those who've made a successful career in music for picture, some common items emerge (in addition to obvious things that everyone creating music needs, like cables, monitors and talent), and it's these I'll focus on this month. Broadly speaking, they are as follows: firstly, a TV, video-cassette recorder (VCR) and associated synchronisation hardware — but see the box towards the end of this article for more on why these are slowly becoming less important. I would argue that you'll also need a computer and MIDI + Audio sequencer/DAW package of your choice, a MIDI controller keyboard, a mixing desk and/or control surface, sound sources and/or sample libraries. If you choose the latter, you'll also need something to run them on, such as software or hardware samplers. It's perfectly possible to criticise the choices on this list of so-called essentials, and more on that in a moment. The first major complaint from many of you out there is probably cost — this lot won't come cheap if you don't have much of it already. Fortunately, there are many areas where you can cut corners and combine equipment into single multi-purpose units; however, you need to bear in mind what cul-de-sacs this may lead you down, and what it could cost to buy yourself out of them later. If possible, you ought to try to bear in mind not just the starting cost, but also the cost of the later upgrade path. Assuming, of course, that you can afford the initial cost, there's no point in spending £100 today, only to have to shell out 10 times that tomorrow if you can pay £1000 initially, and buy some gear that costs less to upgrade later. Some of you may be surprised that I didn't include any non-computer-based recording alternatives in my essentials list. After all, since the humble (and affordable) cassette-based multitracker went digital a few years ago, and began to include effects and CD burners, you could surely argue that portable digital multitrackers now offer everything necessary to record, mix and master to broadcast-quality standard, at a reasonable cost? Well, it's true — with so much in one little box, and the cost saving relative to buying all the bits separately, it's very tempting to opt for such a solution. However, if one section goes down, you'll lose your entire recorder while it's being sorted. Furthermore, when you want a higher track count, different effects, more inputs and so on, you usually end up junking the stand-alone box and starting from scratch. Here are some suggested setups for creating music for picture on three different budgets. They're by no means all-encompassing or exclusive options, but they'll give you an idea of where to start. Note that these systems are based around a PC. Depending on your choice of sequencer/DAW, you might need to use a Mac, in which case everything would look different (and probably more expensive). A modest PC (say a 2.4GHz Pentium 4 with 512MB of RAM and one monitor). Cakewalk Sonar Studio Edition MIDI + Audio sequencer. Yamaha 01X digital mixer/control surface. M-Audio Keystation 49e 49-key MIDI control surface/controller keyboard. Native Instruments Kontakt 2 software sampler. A hefty PC (say a 3.2GHz Pentium 4 with 2GB of RAM, and dual monitors). Yamaha 01V96 digital mixing console. M-Audio Radium 61 MIDI controller/keyboard. Native Instruments Komplete virtual-instrument bundle. CASHEWS — MONEY TO ROAST? A hefty sequencing PC (say a 3.6GHz Pentium 4e with 2GB of RAM, and four monitors). RME Hammerfall MADI card with ADI648 ADAT interface. Kurzweil SP88X 88-note performance controller. Extra PCs for Gigastudio 3 or Kontakt 2. For this reason, amongst others, most media composers these days base their setups around a computer (or several). They're expandable, you have a choice of interfacing options, and there's a wealth of available software and hardware plug-ins. What's more, a computer can handle video playback and sync, effects, audio, and MIDI, but unlike the one-box digital multitracker, you get to choose what goes into the computer: the sequencer, the audio interface, what effects you need, and so on. You can add to the list at will, and if you suddenly find the need for more inputs, you pull out the old audio card, drop in a new one and keep moving; there's no need to bin it all and land yourself back at square one. In this example, as with many other aspects of choosing a studio setup, it's far better to work out what it is you need to be able to do, and then try to fit equipment around it, never the other way around. If you're held hostage to the foibles of a particular piece of kit, you could well compromise both your technical and artistic ability, which is never a good idea. Reliability is another consideration here — I would gladly sacrifice a few bells and whistles for something that doesn't crash or fail to do what it should. In my case this has led to a succession of dull-but-worthy purchases. RME Audio may not be the world's most exciting brand, but in five years, not a single piece of their kit has yet failed on me, whether it's the Hammerfall PCI card series, or the ADI rack boxes with a multitude of MADI, AES-EBU and ADAT interfacing. Main music PC running Sonar 5 and Nuendo with a TC Electronic Powercore Firewire. Additional PCs for running Gigastudio 3 and/or Kontakt 2 (x3). MOTU MIDI Time Piece AVs (x2). TC Electronic Fireworx & M3000 effects. 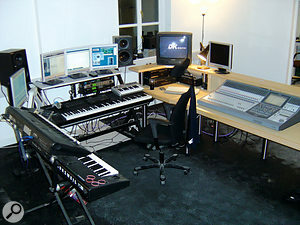 Korg Wavestation and 01/W workstations. Kurzweil PC88, K2500RS, and K2500XS keyboards. VSL Vienna Symphonic Library Pro Edition & Horizon Series. East West Symphonic Orchestra Platinum & Symphonic Choir. East West Storm Drum, Colossus, and Ra. Spectrasonics Stylus RMX, Symphony Of Voices, Vocal Planet, Trilogy, Atmosphere. So, you have a computer — what software do you run on it? To some extent, this will be determined by what sequencer or audio-recording software (if any) you already run, and also by the computer you've chosen. Cakewalk don't write sequencers for the Mac any more, and since Apple bought Emagic, Logic is no longer available for the PC. Just to add to the fun, the major packages come in differing flavours depending on your budget and inclination: Steinberg's product line, for example, progresses through Cubase SE, SL3 and SX3 right up to their high-end production software, Nuendo. Once again, the best course of action is to break down the many options, and consider what you're really going to need, balancing it, of course, with what you can afford. By way of example, imagine you're considering going for Cakewalk's Sonar. This comes in two forms, Studio and the more expensive Producer. The latter offers surround support, a hefty effects bundle, per-channel EQ and video-thumbnail support, all of which are lacking in Studio. However, Producer is a lot more expensive. When you factor in the cost of the bundled plug-ins as separate items, it's probably worthwhile, but otherwise, going for Studio could save you some money. Once you're a registered Studio user, there's a reasonably affordable upgrade path to Producer that you can take later, when you have a little more money in the kitty and really need the extended features Producer can offer you. Two Sonar screens (the author's sequencer of choice) showing scoring work underway on his multi-monitor setup.Of course, this is just an example — I'm not suggesting that Sonar is necessarily the software that all media composers should use, in either of its flavours. The best package for you is of course the one that does what you need it to, doesn't break your piggy bank, and crucially, is the one that you're most at home with. Sonar happens to be my sequencer of choice, but that's irrelevant — the last reason you should use something is because someone else does, even if they're famous (which I'm not!). The only person using it that matters is you; you need to be able to work quickly, efficiently and to the highest possible level of quality that your budget allows. If anything, consider the famous user's kit from the other way around — why is a famous person using a certain piece of kit? Answer: because it's right for them, so do the same and consider the package that's right for you, whatever that might be. So why did I end up using Sonar? Originally, it was because Cakewalk's MIDI sequencer ran under DOS at a time when my computer couldn't handle Windows, which meant in turn that I couldn't use Cubase for Windows v1. And, as so many of us do, I stuck with my first sequencer through its many upgrades, facelifts and relaunches, and ended up a Sonar user. In my experience, it's been reliable and powerful, but I'm well aware that there are plenty of devotees of other sequencing/DAW platforms who claim the same for their favoured package. Perhaps the most important reason that I've stuck with it is that I know Sonar inside out — so if the same is true of say, Cubase SX or Logic for you, then that's the package you should keep using as you begin your demanding, deadline-heavy music-for-picture career. However, all of this doesn't mean that you can't change your mind later. Recently, I've begun using Steinberg's Nuendo, having been tempted away by its amazing Warp-to-picture functions — but I haven't tried to jump ship overnight, and I've kept up with Sonar so that I can always fall back on it for jobs that need to be completed quickly. I mentioned in the first part of this series how difficult it can be when you're working to a tight deadline and equipment fails on you. It's happened to me many times, but I've found a long-term solution by using a reliable equipment supplier based 15 minutes from my studio whom I can rely upon to replace dodgy gear at short notice. I would also argue that it's worth paying a little, if not a lot more for impeccable customer service — someone who answers the phone in seconds, delivers when they promise to, and will answer my stupid questions when I don't understand, or will put me in touch with someone who can answer if they can't. My suppliers have allowed me to get on with worrying about the work, rather than my kit, which is the way it should be. If you can find someone similar to help you in your endeavours (and if possible, also ensure that they're located conveniently close to your studio), you'll never want to use anybody else. Until a couple of years ago, most music-for-picture jobs were supplied on humble VHS cassette, which necessitated slaving a VCR to a sequencer with a synchroniser — in the author's case, a MOTU MIDI Time Piece AV. Recently, though, most video has been supplied as AVI or Quicktime files on CD-ROM and can be run directly within a software DAW such as Nuendo (shown above).Until a couple of years ago, one of the most dull but crucial pieces of equipment in any music-for-picture setup was the synchroniser. Fundamentally, music needs to be fitted to picture, and if the program is edited again later, you need to be able to go back and tweak the music so it still starts, changes and stops on exactly the right frame of video. Some years ago, describing how to do this would have required an article in itself — synchronisation is a minefield of formats and acronyms. I started out with a reel-to-reel multitrack which had a separate sync unit, and later moved on to the Tascam DTRS format (a DA88) with built-in sync capabilities. In both cases, my video cassette recorder acted as the master unit in the system, feeding timecode from the video to drive the sequencer and the audio recorder. The time they took spooling back and forth to get in sync was maddening. However, as you've probably noticed, there haven't been too many articles on video-to-MIDI sync in SOS in recent years, and there's a reason for this — most people have gone digital. For the last couple of years, almost all of the video I've been supplied with has come as a digital video file, which I've been able to load directly into a window in my sequencer and use there, locked to the timeline. Most editors will now supply video masters digitally, be it on DVD, via FTP download or even over email. 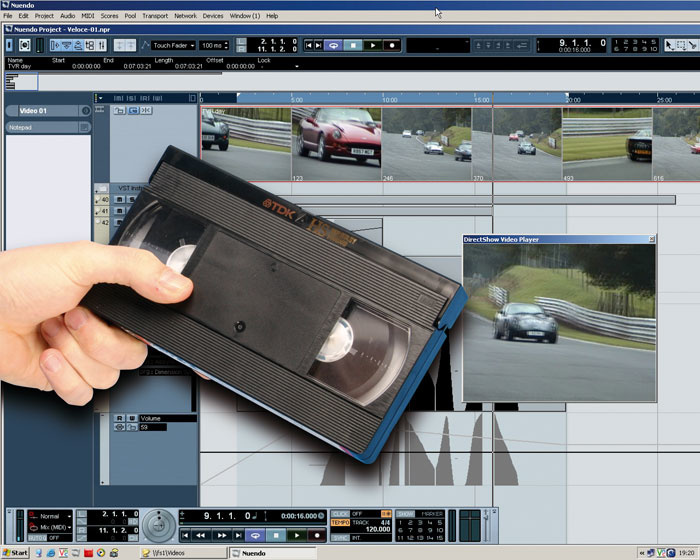 To deal with the rare cases when you might still be given video on cassette tape, it's usually easier to buy a cheap video-capture card and digitise the video yourself for use within your sequencer. With the powerful Warp-to-picture functions of Nuendo 3 and the like, you can do far more with the video when it's all in the computer. There's almost as bewildering an array of samplers available today as there are controller keyboards — what started with the Fairlight as a fantastically expensive tool of electronica devotees has become a mainstay of almost all music production. Now there's a wealth of hardware- and software-based options available, ranging from a 200-quid tabletop box to a four-figure sampling workstation complete with keyboard and sequencer — and the sky's the limit when you start to consider powerful software samplers. As with hardware and software for recording, your choice here will determine your upgrade path, as you also have to consider the sample libraries you're likely to use — the most powerful collections are out of reach of traditional hardware samplers, as they require dedicated PC-based software samplers with fast hard drives from which to stream audio. The industry standard in this field, Gigastudio, is fast being caught up by other software samplers like NI's Kontakt 2. The reason these software sampling systems can be so expensive is that they need a lot of computer processing power to run. Although you can run a software sampler on a modern computer alongside your sequencer, there won't be much CPU power left over for the sampler, which will translate into low playback polyphony. Tascam expect a high-end PC running Gigastudio to produce 300 or so notes of polyphony. This might sound like a lot, but by the time you have layered a couple of instruments with long release times, it can be eaten up very quickly by a couple of chords. The only solution is to add another computer dedicated to sample playback. As you may know, many media composers have two or more PCs dedicated to Gigastudio or Kontakt. Further up the tree, Hollywood composers such as Klaus Badelt have machine rooms filled with 40 or more PCs dedicated to Gigastudio! Again, only you can decide whether you're likely to need this kind of system (you'd better have deep pockets if you do), but there are plenty of smaller-scale systems or affordable hardware, some of it available at decent second-hand prices, which might suffice for your needs at a much lower cost. What else is Ebay for? Once you've got a sampler sorted out, there's the question of what to fill it with. As I hinted in the first part of this series, media composers often spend a great deal of their money on sample libraries. It may seem crazy buying, say, several different expensive piano libraries, but just as with synths and indeed, with real pianos, it's impossible to say which piano library is the 'best' (a question often asked on the SOS forum, despite its complete absurdity). Obviously, if one stood head and shoulders above the rest, then the world would have only one maker of piano libraries (or synths, or real pianos). Different pianos suit different music and playing styles, and of course this judgement is subjective anyway. So which one is 'best' for you is a question only you can answer. Thus you need to demo, test and evaluate the libraries that best suit your field to find the right ones for you. In the case of piano libraries, you will more than likely end up with a handful, each one suiting a different genre or mood. With orchestral libraries, you could well find that you end up cherry-picking instruments out of several libraries to create the end result you desire. In this case, the trouble is that you have to pay for the whole library just to get the instruments you want, and you may not even know which these are until you have had a chance to play with the sounds for a while. In short, sample-buying can become both expensive and addictive! Once you've decided what equipment you're going to populate your studio with, there's another, far less glamorous aspect that requires your attention — furniture. Don't worry — this isn't where I start talking about feng shui and quoting geometric equations to do with ergonomics. More prosaically, however, I will say that I don't know a single composer without a back complaint. You owe it to yourself to make your studio chair a good one — after all, you're going to be sitting on it for hours on end. After years of back trouble, and much havering because it cost so much, I treated myself to a HAG chair, at a cost of over a thousand pounds, and earned the undying love of my spinal column for evermore. I'm not suggesting that you go this far, but do at least give the matter of seating some thought. You should also arrange your studio so that you can see, reach and adjust your most important gear whilst still remaining comfortable. Many Back Care centres will give you advice not only on the various chairs available, but also on optimal posture and the height at which you should place desks and other equipment in relation to your seating position. Ask yourself: is your neck constricted, are you sitting upright against the back of your chair, and do you have to lean at ridiculous angles to alter a setting or two on a piece of outboard? Obviously some reaching and contortion will be necessary occasionally, but the more you can limit it, the more comfortable you will be. How you choose to handle processing and mixing are two interlinked issues that also depend on the rest of your chosen equipment. If you have an external hardware mixer, you can mix traditional outboard effects with computer-based plug-in ones, and the same goes for EQ and other processing. This is my favoured approach — my mastering effects are software, main EQ is handled by my digital mixer, and TC Electronic outboard produces most of my reverb. For some composers, a mixer and external hardware processors are anachronisms. These types favour doing everything in their computer, and handling all the processing there too. The most mixer-like piece of kit you'll find in their studios will be a control surface covered with faders and knobs like a mixer, but through which no actual audio passes. Again, this decision is down to personal choice, existing kit and working requirements — you might not have the space for a separate mixer, or you might still be working with a external recorder that necessitates the use of a mixer. I still have one (a Sony DMX R100) for other reasons; in my case I have to have some way of hearing and mixing audio from several PCs. Control-surface devotees would have me fly all the audio into the workstation PC and then mix down from there. However, this means rendering every track to audio and if I need to tweak one, I have to pull the MIDI back up on the relevant PC, reload the sample, make the changes and then render it to audio all over again. With all the sampled articulations spread over several copies of Gigastudio and Kontakt, a typical simple two-minute orchestral cue would have 30 or so tracks, and rendering them in real time would take about an hour. I can't afford to waste that kind of time achieving nothing except shovelling some audio around, so I've retained the traditional console. That way, I can tweak MIDI-based tracks to my heart's content, hear the results immediately, and also use the Sony to create my final mixes.